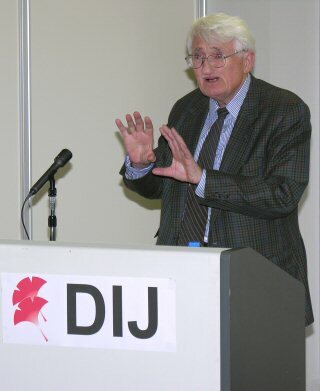 The two-day workshop was centered upon Dr Habermas’ lecture in which he addressed himself to the seemingly academic question of whether the Kantian project of the constitutionalization of international law still has a chance. As it turned out, the little word “still” connected the topic with present-day realities. Couched in a learned review of Immanuel Kant’s essay, “Toward Perpetual Peace,” Habermas discussed a question which, after two hundred years, has lost nothing of its urgency: How can peace be accomplished? Shall international relations be subjected to a legal regime (as supporters of the United Nations Organization argue) or can a peaceful international order be secured only by virtue of the power exercised by a benevolent hegemon (as super-power politicians who can and do violate international law with impunity) insist? Habermas’ answer was clear. The notion of a unipolar world is misleading. While it accurately reflects the distribution of military and political power in the world today, it fails to appreciate the fact “that the complexity of a differentiated and highly interdependent world society can no longer be mastered from a centre.” It is because of these complexities that the Kantian project of the constitutionalization of international law still holds the best hope for peace. Parts of our intellectual heritage, it became clear from Habermas’ lecture, can help us cope with the demands of the present age. The question to what extent this is true and what aspects of tradition continue to be productive was a leitmotif of the six papers that followed, all of which, in one way or another, used Habermas’ work as a reference point. They were presented by Cui Xinjian (Beijing), Cao Weidong (Beijing), Yazawa Shujiro (Tokyo), Kim Sang-Joon (Seoul), Han Sang-Jin (Seoul), and Mishima Ken’ichi (Tokyo), the organizer of the workshop. Kantian Project of the Constitutionalization of International Law. Does it Still Have a Chance?